ArtSites.ca - Elegant and Affordable Artist Websites - Help and Tutorials - Using and Understanding Your "Content Editor"
Throughout the ArtSites system, you will see text editing areas that all work the same. Generically, these are called 'Content Editors'. Here are some basic instructions on how to use them and what to expect. The image below is an example of a 'Content Editor'. It is sometimes called 'XYZ Content' or 'Description' of 'Extra Text'. Regardless of the title, you always have the same options wherever you see it. 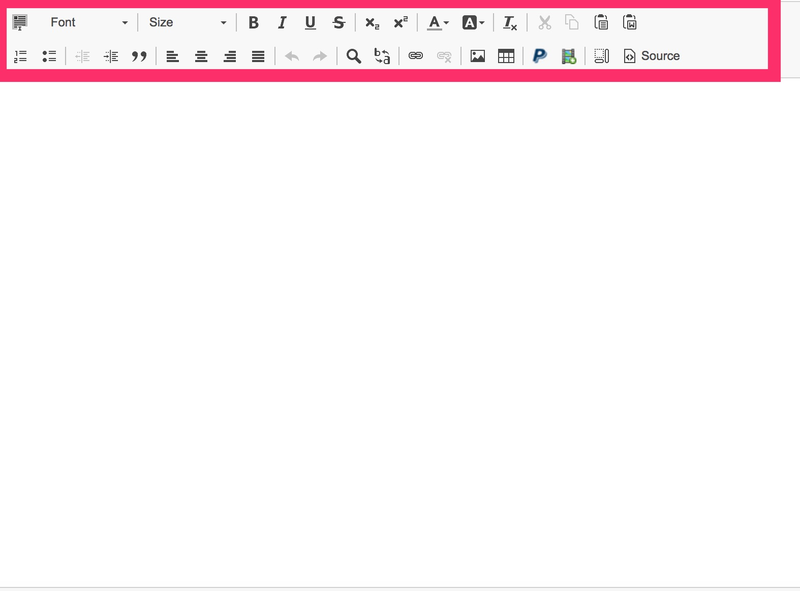 To use any 'Content Editor', simply click in the editing area below the icons. The color of the editing area will match the color scheme of your layout. This gives you a better sense of what your page will look like on your website. Always remember to click the 'Update' button (generally at the bottom of the page) to save your work! We do have a number of tutorials to help you with specific tasks, but feel free to explore and experiment on your own. Once you understand the options provided by the 'Content Editor', you'll be able to finely customize the content on your website. However, if you have any questions, please feel free to reach out to us. We're here to assist and support you!